Abiquiu (AH-bi-kyoo) is an artist enclave and historic village, surrounded by juniper and sage canyonlands of incredible natural beauty. It also has been touted as having the best hiking in all of New Mexico. Settled in 1754 atop ruins of an ancient Tewa pueblo, according to locals, Abiquiu was named for the “northern-most” location one could travel and be protected by the Spanish army. Georgia O’Keeffe and her paintings of its striking landscapes put the small town on the map, and artists and travelers have been inspired by the shifting hues on the Rio Chama and colorful cliffs throughout history. About 48 miles north of Santa Fe, there’s no shortage of natural attractions to explore around Abiquiu. Here are five of the top must-sees. A 21,000-acre retreat and education center, Ghost Ranch is where Georgia O’Keeffe had her summer home. Take a trail ride to see the landscapes that inspired her, or hike to Chimney Rock for a spectacular bird’s-eye view. Near Abiquiu lies an anomalous outcropping of enormous white limestone formations that look like something that would be found in a lunar canyon. Plaza Blanca, or “The White Place,” as O’Keeffe called it, inspired O’Keeffe’s painting series and countless movies have been filmed on site. To get there from New Mexico state Route 554, take County Road 155, and use the Dar al Islam main entrance road. The most remote monastery in the Western Hemisphere, Benedictine Monastery of Christ in the Desert, is only accessible by a winding 13-mile dirt road through the Santa Fe National Forest, but the panoramic views are worth the trip. Visit the chapel, meditation garden, or gift shop selling monk-made coffee, honey, and Belgian-style ales. 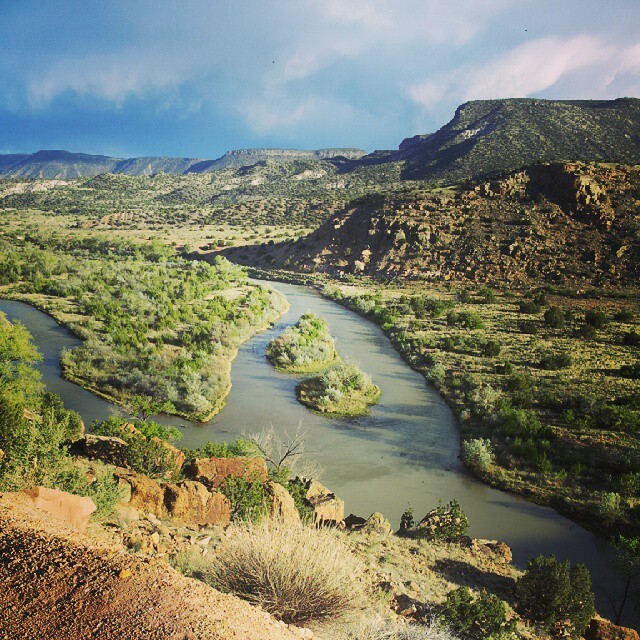 Spanning 5,200 acres, Abiquiu Lake has recreation facilities for picnicking, hiking, swimming, boating, kayaking, fishing, and camping surrounded by vermillion sandstone cliffs. Dip into the soothing baths at Ojo Caliente Mineral Springs, one of the oldest spas in the country. The mineral springs at the foot of the mountain are famous for their rejuvenating, healing waters. The combination of lithium, sodium, iron, arsenic, and soda mineral waters of Ojo Caliente Mineral Springs can’t be found anywhere else in the world. Indulge in a private pool with cliffside views and a crackling Kiva fireplace, creating the perfect atmosphere for stargazing soaks. Where to stay: Conveniently located on U.S. Route 84, Abiquiu Inn makes an ideal hub for exploring. It has 25 comfortably appointed casitas and rooms with Kiva fireplaces and is next door to the O’Keeffe Home and Studio tour office. Year-round camping for $10/night and scenic slot canyon hiking can be found at nearby Echo Amphitheater. Or find rustic guestrooms, plus tent and RV campsites at Ghost Ranch. Where to eat: Services are few in Abiquiu, but that’s the point. Cafe Abiquiu (at Abiquiu Inn) is the only bistro-style restaurant, with a newly expanded patio to enjoy seasonally inspired fare. Gelato or scones and tea make for a great midday break at the Purple Adobe Lavender Farm and Tea House. Grab a pizza or subs at Mamacita Pizzeria. Stock up on fuel and camping supplies at historic Bode’s General Store, open since 1893. Read the article in its entirety in the September 2015 issue of Arizona Highroads magazine.